After your tour with me you too will be satisfied, as were my previous guests! I have utilized TripAdvisor for years now to make an informed choice of hotel, attractions, etc. and have never been steered wrong. This experience was no different. I contacted Peter about 2 months prior to our trip to London and we were lucky enough that he had an opening for this weekend. It had always been a "bucket list" item for me to see the English Countryside - and Peter did not disappoint! He was in contact throughout the booking and payment process, met us promptly at our hotel and whisked us away from London into the countryside exactly according to plan. On the drive, he will tell you as much or as little history about all of England that you care to hear. He is a wealth of knowledge that only years of experience can impart. Our experience in the country and his attention to detail was simply extraordinary! He is all about showing you the best tour possible. Everything from water bottles in the van, to planned drop offs/pick ups to minimize lag time and excessive walking time had already been planned by him as the trip unfolded. We are doing a second trip to Dover tomorrow with him and I am positive that my review of that experience will be just as positive. If you are looking for a great way to have England shown to you, rather than figuring it out yourself - call Peter West - he's your guy.. There's no way a first-time visitor of London can see more of this city. From the start at the meeting point on Heathrow, till the end at our hotel, Peter West was explaining, driving, stopping, walking and pampering. We saw the changing of the guards at the exact best moment, all the highlights, had a great lunch and saw spots that are hard to find (the office of our former queen Wilhelmina during the war) if you don't really prepare (which we didn't). We finished after a long day at our hotel, with a lot of extra information for the other 2 days of our stay. 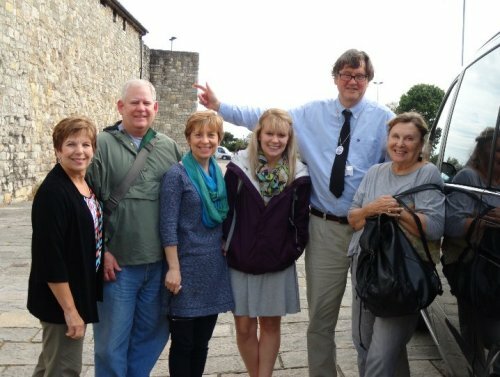 We had the pleasure of having Peter as a guide for a three-generation visit to Stonehenge and Bath. It was such a wonderful experience in every way. Peter has a level of knowledge regarding the two sites that encompassed the history and culture of both. We all learned new information about the area in spite of prior visits for some of the group. Peter has a great way of keeping the younger members of the group engaged. He helped them understand the history, but also helped them understand how all of the earlier cultures had contributed to the current. They came away with considerable interest in both time periods. We heard LOTS about it during the rest of the trip as well as back in Texas. We were so appreciative of all of the other types of information that Peter shared. His knowledge of history provided us with much information. However, Peter also gave us a unique view of the UK including understanding the current politics, economics, and social forces at work. All told, we felt that we had experienced a brief course in English history during the day! Peter was also a great source of information regarding other activities that we were likely to enjoy in London. Thanks to Peter, we added several enjoyable activities to our agenda. In addition to the interest that Peter took in making the historical events meaningful for the children in our party, he showed such consideration for the senior members. One of the party has some mobility issues, and Peter was always considerate in terms of locating good parking, slowing the pace, etc. Although these would seem to be common courtesies for tour guides, it is seldom the case. It was greatly appreciated and contributed to the pleasant atmosphere of the day. Our only regret was that we had not booked Peter for a tour of London as well. All of the 7 members of the group commented several times during the remainder of the trip..."Wish we had Peter to explain this." My family (3 teens and 2 seniors) spent 2 days with Peter on our recent trip to London. Our first tour was the London in a day tour. Peter picked us up at our hotel and whisked us away for a wonderful full day tour. Peter taught us about the history and showed us all of the beautiful pageantry that London has to offer. Even when we ran into some unexpected traffic jams due to parades, Peter made it very educational and enjoyable and manged to get us to all the sights we wanted to see even though he wound up spending and additional hour or two to get us to see everything. Our second tour was Stonehenge/Bath Tour. Again Peter picked us up at our hotel and showed us these beautiful sites all while entertaining us with their amazing history and fun filled facts. Peter always picked enjoyable pubs to visit on our travels and we loved taking in the local delicacies. We would highly recommend Peter West to help you get the most out of your visit to London. My group of six had a great day with Peter touring the sights of London. Even though the traffic was bad and our day went longer than expected, Peter stuck with us and made sure we saw everything planned. A great way to see the city. Yesterday we spent the whole day with Peter and saw the main historic sites of London...this is the BEST way to see London! Peter is super knowledgeable, knows where to be when for the best pictures and experiences, and makes the day fun. We got the best view of the changing of the guard, lots of historical insight on the Tower of London, Westminster Abbey and the areas of London, and some good laughs to boot. I have two teenage kids who LOVED the tour (and they are picky sightseers), I cannot recommend Peter enough! My second tour with Peter in four years. As expected, we had a great time seeing the signs we selected before the trip. Peter is very knowledgeable and kind. Peter picked us up at our hotel just before our start time. He kept us in pace and saw all the sights we wanted during our 8 hour tour. W old recommend without hesitation. My wife and I spent two days last week touring London and the surrounding area with Peter West. He is a top notch, knowledgeable and efficient tour guide, and is the consummate professional. We highly recommend him! Peter West met us on time at our hotel and certainly exceeded our expectations. He knew exactly where to be to get the best pictures and is extremely knowledgeable on all historical facts. We spent the entire day with him, never felt rushed, and yet saw more than we'd ever been able to see on our own. I would certainly come back to London in order to do other tours with him. Best tour guide ever!! As a repeat customer for our second year, Peter again did a great job of leading our group of 6 in his new luxurious Mercedes Van for an 8 hour excursion to Leeds castle. Seemed to never be a dull moment. His engaging general conversation and endless knowledge of detailed England history made it seem like we were catching up with family and taking a history class at the same time. We were fortunate to hit the castle on the last day of its Medieval Festival which was quite an added treat. We just returned from London and our two days with Peter were wonderful. He was prompt, enjoyable, full of knowledge and so very accomadating. We did the full day city tour and had a fabulous tour of Westerminister Abby followed by the changing of the Guard. Peter knew just where to take us so we had the best view and when one of our group had issues with walking he changed things up so we all enjoyed the sights. Peter West looked after us for a week during which time he took us to Cambridge, Duxford, Northampton, London, Salisbury, Bath, Stratford upon Avon, Woodstock and Oxford. We visited Buckingham Palace, Hampton Court, Windsor Castle, Highclere Castle, Salisbury Cathedral, Stonehenge, Shakespeare's House, Blenheim Place, the universities at Cambridge and Oxford, the Imperial War Museum at Duxford, etc and the information and detail provided by Peter was nothing short of superb. He kindled my interest in a number of things we saw, particularly Henry VIII and Sir Winston Churchill and since returning home to Australia I have ordered a number of books on these subjects. There is no way we could have achieved what we did without Peter and highly recommend him for anyone visiting the UK who wants to gain the most from their visit and not have to worry about the driving and/or parking. His selection of the places for lunch was great and gave us a great feeling for the English countryside as well as the scenic places along the way. The only thing I would do differently would be to split the tour into two parts with a couple of days off in between. Peter West is among the best. We have travelled to more than 25 countries and experienced scores of tour guides. Peter is among the best - on time, delivers what is asked for, and extremely knowledgable. I picked Peter from his web site to take my wife for a Downton Abbey experience on her birthday in March. He admitted that he was not familiar with Downton Abbey, the TV production, but would do his best to make the day meaningful. That he did! We toured a bit of London enroute to Bamford, where most of the outside scenes are shot. Then across the country to Byfleet Manor where we enjoyed tea with the owner. In the TV show this is the home of the Lady Violette (Maggie Smith). We also stopped at Hampton Court for a brief visit. All in all the day was outstanding, one my wife and I will remember for many birthdays to come. If in need of a tour guide, do yourself a favor and check out Peter West. 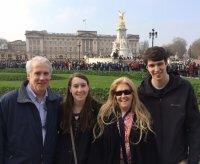 My family and I recently traveled to London and were guided by Peter West. He did an excellent job touring us through the city and showed us all the great sites. Peter was engaging, funny, knowledgeable, and accommodating. He clearly knows his stuff and is an excellent tour guide. I would highly recommend Peter to anyone. Thanks for the great time Peter! Four friends and I booked Peter West to take us on a tour in early February. We had a very full day (probably 14 hours) and went to Windsor Castle, Bath, and a brief stop at Stonehenge.Peter's knowledge of each of the historic sites and a myriad of places along the way was astounding. He is a very pleasant man to talk with. If we had any questions, he knew the answers and generally that led to other conversations. He was very low pressure about the schedule and constantly kept us apprised of any time or distance challenges we faced, leaving the choices in our hands. This flexibility was very appreciated as one of the people in our group had a medical issue which had some affect on our schedule. His vehicle, a reasonably sized Mercedes van easily accommodated the 5 adults in our group , was very comfortable and offered good views of road side attractions. That's important since we spent quite some time traveling between venues (London-Windsor/Eaton-Stonehenge- Bath-London). I highly recommend Peter for anyone wishing to have a great tour experience. In early February, my wife, another couple, and a friend booked Peter for a day to tour Bath and Windsor. We enjoyed it very much and it was great to hear Peter's take on the history of Bath, Windsor, and whatever else we passed by or had a question about. He was very eager to accommodate our needs and better yet he worked in a side trip on the fly. I enjoyed hearing about the local "politics" involved in the administering the heritage sites and tour industry and I'll remain coy regarding the side trip but let's just say Peter knows his way around the history of England and gave us a day that was more than we asked for. If you have the time and want to see London and sites beyond with someone who knows the place and is very willing to share his knowledge and perspective about so much history then your time and investment in a day with Peter will be well spent. While staying in London for a week, my family of four (including 2 teenagers) wanted to get out of the city for a day. I found Peter West on Trip Advisor and decided to book with him after reading all the great reviews. He did NOT disappoint! Booking was easy and email confirmation was prompt. He picked us up (15 minutes early, I might add) at our central London hotel for a full day tour to Stonehenge and Bath. His Mercedes van provided a comfortable journey for the whole family. Peter was friendly and chatty with us regardless of what "dumb" American questions we asked and he filled us in on the history of Stonehenge as we traveled. His knowledge of England's history surpassed many of my university professors! He even made an unplanned stop at a roadside McDonalds for the teenagers in tow who were hankering for a Sausage McMuffin!! The next destination was Bath... But first Peter made an extra potty stop for us... Thanks to all those beers enjoyed at the Inn during lunch. Seeing The Roman baths with Peter was better than any "audio guide" they offered. He offered his knowledge and insight throughout the experience. The town of Bath was beautiful... I only wish we'd had more time there. Next time I visit England, I'll spend a few days there. Peter had us back in central London on time- he even dropped us off at the Hard Rock Cafe for dinner instead of back to the hotel (again, two teenage boys were "starving" at that point!) All in all, it was a wonderful tour and I recommend Peter to anyone who wants an experienced guide in or around England. He will not disappoint!! Peter West's knowledge was incredible as he provide 6 of us a private tour through the countryside from London - Bath - LaCocke (lunch) - Stonehenge. Peter's historical knowledge, detail & storytelling kept everyone engaged. We have all ready recommended Peter West to several of our friends. Great value! 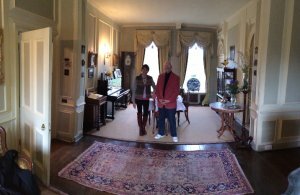 I wanted to see three historic properties in Kent and the only way to do it was with a private guide/driver. From the reviews on TripAdvisor I found Peter and he made fantastic suggestions, among them that realistically we could only see two. How right he was! We spent a full day in the country, breaking for a lunch at a delightful inn in a charming village with a picture perfect churchyard. All in all the outing was a great success due to the beautiful day and outstanding sites plus Peter's enthusiasm for all things historic and his expert driving. Highly recommended. We had limited time in the UK and chose to do a one-day tour with Peter. The booking was seamless, Peter picked us up early at our hotel and provided a fabulous tour of Bath and Stonehenge. We had a delightful lunch at a small English pub in between the two sites. Highly recommended! From the first email contact with Peter last March through our tour the first week of October, he has been very responsive and helpful--all emails were answered within a day. He was able to help us set up a 6-day tour of stately homes, and suggested very fine accommodations. 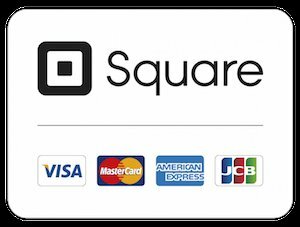 He is punctual, personable, a good driver, and very knowledgeable about all sites and areas that we visited. He accommodated all changes and special requests with flexibility. It was a wonderful week that we could not possibly have done without a private driver. We spent several days touring with Peter in August. We saw London, Oxford, Stratford, the Cotswolds, Arundel and Brighton. Peter is an excellent guide. He is knowledgable and patient. He tailors his tours to reflect client interests. He is a safe driver with a lovely comfortable Mercedes van. He knows the back roads well and can get you where you want to go, while seeing sights off the beaten path. He is a pleasure to deal with and lovely to speak with. You will enjoy your time with Peter. This time we visited Stonehenge. Peter is very knowledgeable about all the sights we have visited over a several year period. We always end up at a unique restaurant for lunch. We can not speak highly enough of the quality of the tours we have enjoyed with Peter. Despite travel problems, Peter did everything possible to make sure our first- time in Europe children had a great experience in London. He was historically accurate (not always the case with guides) and went out of his way to accommodate some travelers with limitations while still making all the high spots. We had five people in our group, so a private tour was better than a tour bus and no more expensive. Just hours before our scheduled tour I emailed Peter to say my 9 year old Son had spiked a fever. Peter quickly became our guide to finding a local doctor, offering to pick us up and help. A few hours later our Son was better and we decided to go ahead with the tour of Windsor castle. His knowledge was top quality, and made sure we had a terrific experience. With so many guides advertising Peter is trustworthy prompt and above all.. A good guy. Highly recommended. Put on your big ears and sharpen up your brain for Peter is a font of knowledge that he is want to share. He is accommodating and wants to make sure you get your money's worth. Highly recommended! Had a wonderful day with Peter as our guide. We hired him to take us to Stonehenge and Felpham, a village with important links to our family' s past. Throughout our travel Peter was informative, accommodating, and compassionate. His knowledge of Stonehenge and English history added greatly to our experience. We will definitely hire Peter during our next visit to the UK. In June I took my daughter to London. Peter picked us up at the airport and we were off! Not only is Peter very personable but he is a walking history book! Our trip to Stratford upon Avon was the best and I highly recommend this. Lunch at a quaint Inn and doing what we wanted is so superior to riding a tour bus. If you are planning a trip and want a personal tour with someone FUN call Peter. Money so well spent! Peter I hope to be able to doit again someday. This was our first time with a Blue Badge guide, but after a day with Peter touring these 3 sites, it will not be our last. This was so much better then the crowded bus tours and mobs of people on line waiting to see these attractions that we will never do that again. Peter knew all the sites extremely well, was able to avoid the long waits to enter the sites, and provided the expert narrative to make the sites come alive. But as exciting as these sites were, the highlight for us was a relaxing lunch at a small and extremely cool restaurant in the countryside (The George Inn). If you take the trip to Bath with Peter, be sure to stop here. So if you want to make a trip to these locations even more special, give Peter a call. 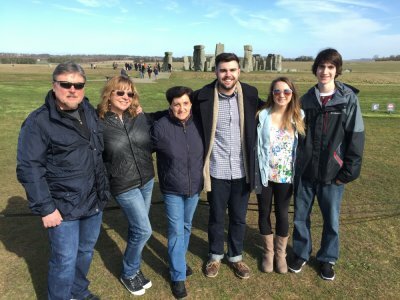 I took my family to London and scheduled a day tour of Stonehenge, Lacock and Bath England. What a great surprise! Peter was congenial, very knowledgeable and was able to navigate the back roads quickly and safely. We thoroughly enjoyed his insights, conversation, wit and charm. We'll be back with him again! His tour was a tremendous value, you won't be disappointed. Peter showed my friends in from all over the US a great time all around London. He knew his history!! Plus, he had secret places for us to view the Changing of the Guard, Horse Guard, etc. and we didn't have to stand around waiting or hours!! Peter was also very charming. Would definitely hire Peter again for our next group!! Peter took us on a one day tour of Windsor Castle, Stonehenge and Bath. What a information packed day! A highlight of the day however, was our lunch at an off the beaten path, authentic English Pub -what a delight and great food as well! We highly recommend Peter, a knowledgeable, personable and pleasant tour guide. Just returned from a three country visit to Europe, including a one day stay in London. Hired Peter for a city tour, and spent a most enjoyable four hours with Peter, who was so knowledgeable, charming, and witty. He showed us the highlights of this wonderful city, and gave us all the historical facts of each stop. If you want a great tour of London, hire Peter. You will not be disappointed. Peter was very knowledgeable and we very much enjoyed our tours with him. He did a great job, even though we were there during the coldest March in 30 years. I would highly recommend him. We spent a day with Peter West this week doing a London city tour. He was very personable, extremely knowledgable, and very patient with us. It was important to have us in just the right place at the right time to see the guard parade and a changing of the guard. He chose a nice reasonable place for us to sit down and take a lunch break. He was so kind to deliver us items to our hotel which was close to his home to make sure our grandchild gets his toy we left in his car! You won't go wrong if you choose to spend a day with him! Did two tours with Peter - Bath / Stonehenge & The Cotswolds. Both tours were great and Peter went out of his way to ensure we had wonderful days. Picked us up at our hotel, talked us through our route in terms of historical significance and interesting facts and gave us lovely tours of our destinations. Went above and beyond by taking us past some great sites that were not expected (Windsor and Warwick Castles, Oxford, etc.). Booked us some great meals in authentic English pubs and ensured the service was efficient so as to not cut into our day too much. Went over our alloted time in Bath to ensure we got to see the Roman Baths on the busy Easter weekend. Overall a great two days and we would recommend Peter to anyone looking to see the sights on a private tour. The Williams Family. We had Peter drive us to Stratford from London for the whole day -- leaving at 9 am and we did not return until well after midnight. We saw the sights in Stratford and then went to see Hamlet at the RSC theater in Stratford. Peter did not hesitate to book this very long day. We knows a lot about English history and about the city of London. He was great with his communicating too -- always very quick to get back to my emails. This was a very informative and efficient way to do Stratford in a day. Something that we would not have been able to do easily on our own. Peter was amazing, very knowledgeable, we really got to see London and the countryside the way it should be, He provided us with a lot of information ,He has a wonderful sense of humor we truly had a great experience. I recently booked three days of tours for my family with Peter. Peter was instrumental in guiding me with respect to the tours that would be suitable for me and my family. He was honest, frank, knowledgeable and extremely helpful. I reviewed his website carefully before speaking with Peter to educate myself. Peter's website is easy to navigate and full of helpful information. I then spoke with and exchanged emails with Peter. He was professional, prompt and polite. He took great care and spent the timecnecessary to respond to every question asked in great detail, leaving nothing to be assumed. He made himself available until a late hour on several occasions and pleasantly surprised me by responding promptly to correspondence sent to him in the wee hours of the morning (London time). With Peter's detailed assistance I was able to tailor our touring days to our interests. Given Peter's attention to detail and great efforts, care and attention to his customer's needs, we cannot wait to take the tours we booked with Peter. You should feel comfortable booking tours with Peter. Take his advice. It will be worth it. Peter was not only an extremely knowledgable tour guide but he was prompt, flexible and funny. My kids ages 11 and 14 enjoyed his interesting tidbits regarding the English culture, the monarchies and history. While we drove through the city he provided information and interesting facts. My family agrees that Peter's tour throughout London, Westminster Abbey and the Tour of London was an experience we will cherish. I travel often and have hired many private guides through the years. In short, Peter West is the best guide that I have ever used. My nephew and I had tickets to watch an NBA basketball game at the O2 and my mom and sister had decided to tag along on the trip. I had been to London before, but the others had not. I gave Peter a pretty tall order, essentially to keep four people of varying ages (16-81) with varying interests and energy levels entertained for 3 days. Suffice it to say, Peter succeeded far beyond my hopes. We all had an absolutely fabulous time. Based on some general ideas that I had given him, he put together an itinerary focused on London's most important historical sights, coupled with fun elements. We spent two full days touring through London with Peter guiding us through Westminster Abbey, the Tower of London and the Cabinet War Rooms. We also saw the Houses of Parliament, St. Paul's Cathedral, Trafalgar Square and just about every other notable London attraction. We spent our third day visiting Windsor Castle, Eton and Hampton Court. Along the way, Peter provided expert commentary, peppered with interesting tidbits and often hilarious asides. He also picked the best pubs for lunch -- very nice places with lots of British character and delicious food. I should note that he did all of this while negotiating a January snow spell. We liked Peter so much that we will certainly look to him on our next trip to Britain -- perhaps, one based on visits to the Cotswolds, Stonehenge & Bath. 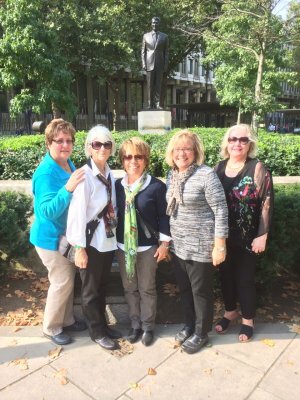 A group of us traveled to London from the US. Mr. Peter West was a great choice to see Windsor Castle, Stonehenge, and Bath. It was easy to communicate (via email) and book the trip. He picked us up promptly at the arranged time outside our accommodations in London in a nice, comfortable van. He was prepared at each destination with the ways to manage the crowds and maximize our experiences. He is full of history and knowledge that greatly added to every experience. Be warned, most of us fell asleep on the way back from Bath after the long day in the long car ride. We just arrived home from London and we completed two tours with Peter. The tours included a full day in London and a half day at Hampton Court. Peter is a true professional and he is genuinley excited and proud to share the history of his country. My family, including kids aged 19, 17 and 11, loved our time with Peter and his tours were the highlight of our trip. Peter was at our hotel as scheduled ready to go and the tours were non-stop with facts and fantastic sights. While the tours were very educational, there were also plenty of laughs in a very relaxed and fun atmosphere. When we return to London a top priority will be to plan another day with Peter and he has our recommendation and gratitude. 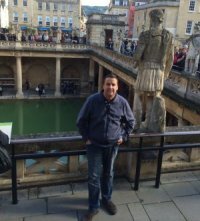 "Windsor Castle, Stonehenge and Bath"
If you are looking for a tour guide that is knowledgeable and efficient, Peter West is your guide. From the pre-tour questions thru booking, Peter is quick with email responses. Our tour, with a family of 6, on 12/29/12, was timed so that we could see everything we wanted to see, and even with some unforseen traffic, we succeeded! Peter even thought enough ahead to have our lunches pre-ordered so that we could enjoy a hearty lunch! His current events and historical knowledge is extensive. Highly recommended! Peter was waiting for us outside the Pancras. Since we were headed to Canterbury, Peter started out trying to follow that long ago path of Chaucer's pilgrims, great idea, but traffic soon drove us to an alternate route, and we got to hear a few of Peter's choice words about our mother city's traffic interference with his plans. Fun. Peter is just a very good, knowledgeable, efficient, professional guide. It is how he makes his living, and he is very good at it. Want a guide? Hire Peter! But not mid-June of 2013, I need him again. "Amazing Day with Peter at Windsor Castle, Stonehenge and Bath." Our family had a fantastic day seeing the sights with Peter. From the moment he picked us up at our hotel, he entertained us with stories, facts and fun. Our group ranged in age from 11 to 80 and we all enjoyed our day with Peter as our guide. I will absolutely use him again the next time we travel to the UK and highly recommend his services. My family and I spent a week visiting London and while we had many great experiences the most memorable by far was the day we spent with Peter. Peter's historical knowledge of London and its surrounding areas is second to none. We found Peter to be professional, insightful and I left that day with an in depth knowledge of what we were actually seeing. We are looking forward to our next trip with Peter as our personal guide. "A Terrific Day Touring London"
We had a terrific day with Peter touring London by car along with side visits to both Westminster Abbey and the Tower of London. Peter was both knowledgeable and entertaining and we very much enjoyed learning the history of London and the monarchy through his eyes. Well done Peter and thank you! "A full day of culture and history - Windsor, Stonehenge, and Bath"
Had a wonderful day with Peter West touring Windsor, Stonehenge, and Bath. He was a very amiable fellow and was very patient with our group. The pub he took us to outside Windsor had the most delicious Fish and Chips. Stonehenge was made interesting because of his stories and Bath, though we missed going into the Roman Baths, was still an all-around beautiful place. Peter was great at showing us around and helping us appreciate the area. Wouldn't have had it any other way. "Full Day Walking Tour of London and Big Day at Stonehenge, Oxford and Warwick"
We just returned from London where we had a chance to spend 2 days with Peter West as our guide. Our first day was spent walking around or taking the tube and bus around London. While it was alot of walking, this was an excellent way to see the City and you avoided all the of traffic issues you might find in a car. Peter was on time, clearly knew his way around and was a whiz at knowing every date of every monarch, a real chronological historian. He also knew good places to eat, which were reasonably priced and very good. Our second day was really where Peter's uniqueness could be seen. He built a customized Stonehenge, Oxford (Harry Potter highlights only) and Warwick Castle day for us that I just could not find elsewhere. He had the experience and stamina to get this all done in one day, albeit a long 12 hour one, which made for very efficient, enjoyable sightseeing and learning for our group of 5 experienced, energetic and efficient travellers - 3 adults and 2 children (10 and 13). He even managed an additional quick stop at Stratford Upon Avon for a evening stroll. On the second day in addition to learning about the sites we visited, we really learned about how people today live and we were able to discuss the contrast across different cultures with Peter easily. Peter put our safety first at all times and his van was very clean and comfortable. We very much enjoyed our time in London and are so grateful that we found Peter to make our experience more educational and complete. "Day trip from London to Oxford, The Cotswolds and Stratford on Avon"
Peter took our group of 6 from our hotel in London for an all day trip out of the city. We went to Oxford first, and on the way, Peter kept us entertained with his many stories and history lessons. Our next stop was Stratford on Avon, and we had a lovely lunch and tour of the town. He was very accomodating, and fun to be with. I would highly recommend Peter as a tour guide. He is reliable and easy to work with. "two day family tour with Peter West"
This is our second tour with Peter. We were two adults and three children ages 10,11, and 12 . This time as well as the last was wonderful. He now has a new van, very comfortable, and we thoroughly enjoyed our walking tour of half day as well as our full day van tour. London traffic was impossible, as there was a marathon going on, but we managed to cover everything we wanted to see. Peter is very knowledgeable re dates and history, and was delightful with the kids. He even climbed to the top of St Paul's with them and managed to make it a fun experience. He was very accommodating about droping us off at out of the way places at the end of our tours even tho it was past the alloted time. All in all, I would highly recommend Peter to anyone, but especially families with children. If you're looking for a fun, personable, experienced guide...Peter's your man. My Mother, sister and I decided that we wanted to spend our last day in the London area exploring Blenheim Palace and we found Peter. Peter was informed, came up with a great plan for the day and was willing to accommodate our schedule perfectly. I look forward to returning to London soon- and will be contacting Peter again for another wonderful adventure. 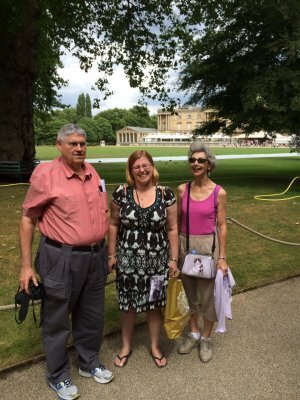 We four adults toured London with Peter West a day before our cruise. He took us to the Tower of London and Westminister Abbey, as we requested. Also, we walked and road around the city. He is very informed and we had a great time. My wife and I have hired several private tour guides in several different locations. I have never even thought to write a review in that most were so so. We are booked on a cruise out of Southampton and decided since we have never been to London it made sense to spend a few days here before departing. Having only a few short days we wanted to see and get as much out of it as possible. Well let me tell you, I could not have made a better choice. Our experience was all and more than we could have expected. Peter picked us up promptly as agreed on our first day in for a four hour tour and again on day two for a full day. If you are looking for a guide who is accommodating, respectfull and most of all with an extreme wealth of accumulated knowledge, who will make it easy and pleasant to follow, look no further. This is the guide for you. "Highlight of our London visit"
Our party of 3 booked a last minute full day tour of London with Peter. We only had a short time in London and wanted to see all that we could. Even though Peter had no time to prepare, he did not disappoint. All of us very much enjoyed or tour with Peter, it ended up being the highlight of our trip to London. We would all highly recommend Peter for a tour. He was very informative and personable. Our private tour for eight was assigned to David, who was an excellent guide. We had a wonderful day visiting Stonehenge, Lacock, and Bath. David was very knowledgeable of the entire region and answered our endless questions. He was also great with our children which was a pleasant bonus. The process of booking the tour was a breeze, aided by quick responses to all inquiries. Would highly recommend and plan to book again. my family of 4 had a day tour with peter about 2 weeks ago, and we were very happy with his insight and knowledge base. I even threw him a few curveball questions that had him cracking up but gave me thorough answers. My family of four visited London for the first time and since we were only in London for one day we wanted a tour that would enable us to visit all the main attractions in London. Peter delivered this to us. He gave us a wonderful tour that was very informative and interesting. I would definitely recommend Peter, he was a fantastic tour guide! Having been to London several times, my husband and I were looking for something out of the ordinary in London. Peter is a wonderful guide. He knows so much about London, the history of England, the culture and current events. He was able to show us some interesting sights we had not seen before and provide a wealth of information. Peter has something to offer everyone and I highly recommend him. We had a fantastic day and Peter did a lot to make it happen. "Castles and Stately Homes in Kent, England"
We saved the best for the last day of our stay in England with our full day tour of Sissinghurst, Leeds and Chartwell all located in the area know as the 'Gardens of England' south east of London about 1 hour 30 minutes from our hotel. What a fabulously charming & unspoiled place on earth this was! All 3 homes offered fantastic and diverse history/stories, architecture and gardens that the British do so well. With the special treat of also seeing master works of art in these private collections that decorate the homes. We enjoyed our picnic lunch on the banks at Leeds Castle. Our daughter was doing cartwheels across the stunning 'moat walk' at Sissinghurst gardens and we were in awe of Winston Churchill's life at Chartwell. Peter West of Private Tours UK understood the individual customer service that our family wanted from his service and he met our expectations. He personally went above and beyond starting with my initial inquiring via e-mail to his follow up e-mail sending us a few family and garden pictures from the trip. Along with this fabulous adventure we received a great value for the fee. My husband and I along with two other couples were visiting London a few weeks ago and had booked a full day tour of London with Peter. We were extremely pleased with every aspect of the day. Peter was waiting for us at the hotel when we came downstairs that morning, was extremely knowledgeable and presented information in a manner we could all understanfd. He also had a good sense of humor. We had a wonderful and informative day and would not hesitate to recommend Private Tours UK and Peter to any friends and family traveling in London. Thanks again Peter. "Peter is the best and a trip saver for our family"
We had the absolute pleasure of spending a very full 14 hour day with Peter at the end of June. Our group consisted of my wife and myself plus our 3 adult kids (in there 20's). On our trip we visited Windsor Castle, Stonehenge and Oxford - which is likely more than anyone should attempt in one day but Peter was up to the task and made the day very special for all of us. His knowledge of all the sites visited, especially Windsor Castle where he knows everyone and everything about it's history, it's treasures and what you really need to see is incredible. Peter's ability to navigate a very crowded site in order to give us the best possible tour with every detail one could desire and at the same time knowing how to go from area to area to avoid long lines made our visit spectacular and one we will never forget. Then on to Stonehenge where he helped us understand the site and what it took to create it 5,000 years ago. We learned a great deal that never would have been possible had we attempted to see it on our own. Finally we went to Oxford (only because I had requested it and now realize it was too much for one day). Despite the fact we got there after things had mostly shut down we got a great tour of Oxford and its famous sites from Peter with details about Christ Church and the city and campuses of the University. We were in the car for almost 6 hours of the day, but those hours consisted of many strories and details of the history of London and England along with some napping and one on one conversation between members of our family and Peter. All I can say is if you are in London and want the best tour possible from a wonderful person with unbelievable knowledge CALL PETER NOW. Finally after our 14 hour day and at now 11 PM London time our daughter realized she had lost her camera with all the pictures from our tour. We looked everywhere and finally I called Peter to see if he could check if it was in his car. He had to get out of bed, walk 2 blocks to his car and search on hands and knees under seats and he found the camera stuffed between the front seats and then arranged to meet us before his scheduled tour the following day to return it. This final act is certainly a sign of the integrity of Peter and his desire to make every detail and every tour special for that particular group. Peter, thank you for a great day and we hope to get to tour again with you soon. "Great Excursion despite a Rainly Day"
We are a family with 3 children and we took Peter's services for a day in London and another day for Warwick Castle and Stratford upon Avon. Our day started with Peter picking us up in his van that comfortably seated all 5 of us. We were initially worried if the children would appreciate looking at churches and castle but Peter's knowledge of history and his ability to tell it as a story keep us all interested. Our children were engaged and I was very happy that they were very comfortable asking Peter questions. On our second day, we toured warwick castle and stratford upon Avon. Unfortunately, it rained the whole day. 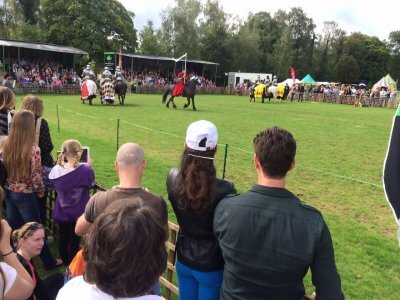 Most of the outdoor activities in Warwick castle were cancelled like the jousting, archery and birds of prey. But we still made the best use of the day touring the inside of castle and whenever necessary, Peter was able to provide additional information regarding the history and personalities who lived in Warwick castle before. Stratford was very interesting beyong that it was the birth place of Shakespear. It gave an insight in the common lives of people who lived at that time. Peter was able to show us several properties despite the rain. As we rode the van back to London, everyone was pleasantly tired. We were very satisfied with touring in this manner and we highly recommend Peter's private tours. "Touring Windsor Castle and Hampton Court, London with Peter West"
We spent a full day touring both Windsor Castle and Hampton Court with PrivateTours UK - Peter West. Peter's knowlege of London, these specific castles, the history and lots of detail while visiting each site made the experience far superior than trying to do these tours on your own. The nice comfortable Van for travel between sites was great and the personalized service is excellant. Highly recommended. "Peter West is wonderful guide!!!!!!" Mr. West was absolutely perfect to show us London and the surrounding area highlights. We traveled with our two children, ages 18 and 20, so our interests varied, but Mr. West was able to keep everyone interested and entertained. He was very patient with our diverse interests and comments. He helped us find sold-out theater tickets! He and my husband, who is a real history buff, got along really well sharing their knowledge of history and then actually seeing the historical sights. I am so glad I met him and will definitely use him again if and when we go back to England! "Peter West is the Best!!!" My friend and I arrived in London for only one day and have never set foot in London so it was crucial that we, 2 women, find someone to drive us around and show us the sites in as little time as possible. Peter West did exactly that! Having our own personal guide made our tour to what we wanted and within our 5 hour time allowance. First of all I would never want to drive in the city with all the different barriers and detours due to the upcoming Olympics but Peter effortlessly drove us around in his Mercedes 4x4. We are from a tiny rural community in the States so not having the stress of worrying how to get around made this a definite must for us. We desired to see Buckingham Palace and got there in time to see the changing of the guard and Peter led us around to the best vantage point to see. I discovered that my batteries had died in my camera so Peter brought his ipad with him to take pictures for us during our whole tour. Peter safely guided us through crowds, traffic and protesters and we felt completely safe in his company. He simply amazed us with his unlimited knowledge of the history of the area and his wit and humor! He was simply delightful! We could stop any time we needed and went at our pace to enjoy each stop we had requested. I will never settle for anything less and will certainly request Peter again the next time we visit London. He made our trip a dream come true and was so worth the money!!!! Thank you Peter for your kind and attentive care! I highly recommend him!!! "Great Tours with Peter - Actually the BEST!" Peter guided around London for 2 days and we had a great time! He was insightful, funny, entertaining and he knew all the "ins" and "outs" of the attractions. Our trip was made by his passion for showing us and telling us the hidden history of all of the places we went to. He even did a great job of recommending things to do when we were on our own in the evenings and on the days where we did not see him. He comes with our families HIGHEST recommendation. BTW, we have traveled to other locales throughout Europe and used many tour guides and Peter ranks among the highest and most memorable ones ever! Our family had just one day to spend in London, and we booked Peter West's Private Tours UK. Although we had pre-conceived lofty expectations based upon his rave reviews on tripadvisor.com, Peter managed to exceed them. He is extremely personable and passionate about his work. His intricate knowledge of London's landmarks, history, government, and monuments made for an extremely enriching and rewarding experience. Our youngest son who had spent four days experiencing excellent guided tours in Paris bestowed upon Peter the moniker of " the most awesome guide ever." Our only regret is that we had just one day to spend with him. Should we return to The UK, we will structure our trip around his availability. Thank you Peter for a truly memorable day. Highly recommended. "Even beyond our high expectations"
We have just finished our day long private tour with Peter. I can't say enough great things about Peter and the wonderful tour of London that we embarked on today. We saw everything that we wanted to see- Westminster Abbey, Tower of London, Tower Bridge, the Red Coated guards etc, etc. He was so charming and knowledgable, my husband and I learned so much and on our next trip to London will certainly book another tour with Peter and have him take us out of the city. He knows everything about London and you can tailor the tour to what you would like to see. Extremely highly recommended. Our family was in london to celebrate my daughter's 18th bday. I booked it when we were still in Manila, Philippines. I am happy i did my booking 2 months ahead. Since if is a private tour we had the option to change our schedule base on the weather. First day we did stratford upon Avon - Bath - Stonehenge. Although it was end to end but Peter was able to accomodate our request. 2nd day city tour - Buckingham changing of the guards the complete one, tower of london, house of parliament with big ben, london eye, westminster cathedral. "London day tour and Stonehenge & Bath Tour"
Peter gave us a unforgettable two days trip in London. 1st day Peter picked us up from Gatwick Hilton and we did a London day tour. Weather was not great but Peter was so knowlegeable and we got excited just listening to him in the van. As this is very private tour we could tailor our trip. If we wanted to stop for a drink or toilet stop, we just had to ask. Next day we did a Stonehenge and Bath tour. As its not a big coach Peter drove us off the beaten track and we could see lots of beautiful country side as well. And we stopped at a village called Lacock and had lunch. It was a beautiful tiny village and very good food. I would recommend privatetoursuk to anyone going to UK. Peter has done guiding for may years and very informative. "Stonehenge, Lacock and Bath, oh my!" We were doing an 11 day European tour with no spare minutes except for the day that we arrived in London. Peter was very professional when we booked the tour online and even picked us up at the airport to start the tour. What a wonderful day even though we were exhausted from the flight from Los Angeles. He explained things to us along the way and was kind and patient with our picture taking. Stonehenge is amazing, much larger than I had imagined. Then off to Lacock for lunch at the George Inn. Lovely village that was like stepping back in time. We had a very thorough tour of facinating Bath before Peter took us to London and dropped us at our hotel. I would happily recommend Peter West as a tour guide. "Very informative, exciting, well planned day." Peter gave us 2 excellent tours of the city of london and another of stonehedge and windsor castle. Peter arrived early on both days and took the time to explain and show us many sites other than what was specifically mentioned in the tours. He was very nice to my 2 teens and 1 college aged daughter. We all enjoyed Peter guiding us.He cared so much that we see everything ahead of the crowds and knew exactly how to do this His tours far exceeding our expectations.I highly recommend touring with Peter West. "Lovely day touring the Cotswolds"
Peter gave us a wonderful day, just what we sought. An entire 10 hours away from London touring the Cotswolds with all of the scenery and completely without tourists! As experienced travelers, we try to do only one major thing in a day, and Peter gave us the perfect experience. I had visited before, many years ago, and wanted to have my wife see it with me. It was just fabulous. Chipping Campden is such a lovely spot - we ended there before the return drive to London. Would certainly recommend Peter's services. Thanks, Peter!!! "Tour of London with Peter West"
We had a great day with Peter touring London. He was extremely knowledgable and interseting. We saw many historical sights and Peter gave us the historical perspective of each, but also made the tour fun! "Time and money well spent. Fantastic." We had a limited time in London. Peter helped us see and learn about much more than would have been possible on our own. He was personable, very knowledgable, and professional. We have taken similar tours in several other European cities and an found this tour to be among the best. Thank you Peter for a superior experience. If you are looking for in depth history and knowledge of London and all of Great Britain, Peter is your guy. He is passionate, patriotic, and full of infinite knowledge. His tours are one of a kind. "Westminster Abbey and the day-trips were great!" We were amazed by Peter's knowledge in London and going out to Bath, Stonehenge, Oxford and Stratford-on-Avon. "Touring with Peter West: Good company and good guiding in southern England." Peter West, did a good job helping us plan out our day of touring, London to Windsor to Bath and back. He advised that it was very ambitious time-wise, but was willing to give it a shot. He is great company to be and very knowledgeable. We did over plan but had a very good day with him and there was some serendipity. We had lunch in a small village Bray, very fun and saw the Fat Duck, the uber expensive and hard to get into restaurant that had caught our interest as well as saw another exclusive restaurant by the river. But loved the lunch at the pub. Traffic was bad and we got to Bath too late for our planned attractions, but had a great walk around the town and ended up in the village Lacock for dinner at a pub there. Peter also picked us up at the airport and it was nice having that all set up and helped launch our days in London. I highly recommend Peter.